hard not to chill out and relax here. Absolutely loved it there. The people are very kind and there is so much culture to explore. Moroccon tea is a must have. We organize unique, original, cultural and exotic travels around Morocco, with us, Sahara Expedition 4 X 4, you will discover the charms of this so magical country, fall in love with his people and you will know what the conventional tourist does not perceive. We will be beside you for everything that you need, we customize your trip if you wish, our priority is to make the trip to suit you. We have a variety of accommodations available. You will be hosted in place that go further to suit you, depending on your budget and your needs, so can stay you in 3, 4, or 5 star hotels or in marvelous Ryads. We invite you to discover the beauty and charm of Morocco with us. I have been fortunate to have visited a few places in my lifetime but none stand out to me quite like Agadir in Morocco. Being by the sea, Agadir is cool. The breeze that comes into the town brings with it sand which covers the ornate streets like a brown sand, and even though it is not what you would call a party town in comparison to say, Ibiza, you are never left feeling like this is a town in need of a few more tourists. The people are friendly and whilst the menus available might not be to everyone's tastes (the food, regardless of nationality, is cooked by Moroccans), with a little research you can certainly find something to suit every palette. All in all I loved the fact that you can hire a bike with little more than a desire to get dusty. Just make sure that if you do decide to go to Agadir, you don't leave until you've gone Quad biking with the locals. Amazing. 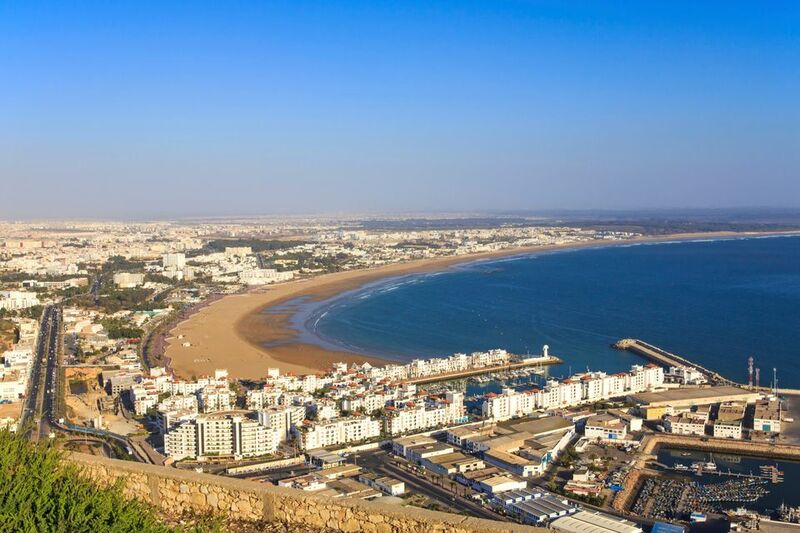 The most beautiful beaches in Morocco are said to be in the area north of Agadir. Little villages like Taghazout and Imiouadar are all within driving distance and worth a day trip (we wanted to stay a night in Taghazout but couldn't find accommodations). In Agadir itself, lose yourself in Souk Lhed, the biggest souk in Morocco. not mutch to see in agadir, lovely beach !